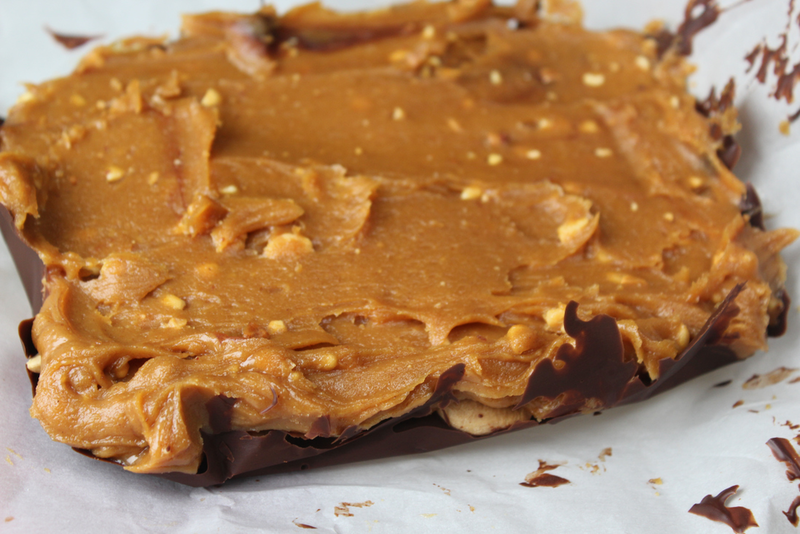 Place parchment paper in a pan ( I used 4×6 I think) and melt chocolate in the microwave or on the stove. Pour melted chocolate into the pan and sprinkle a layer of cashews on top and put in the freezer. In a bowl mix honey, peanut butter, and vanilla. In a separate bowl combine powdered peanut butter with enough water to make it a smooth consistency. Add this to the bowl with the honey and regular peanut butter. Take chocolate out of the freezer and spread this layer on top. Place back in the freezer to harden a bit. When you take it out to cut it, you may need to let the chocolate soften a bit before being able to cut it into even squares.